Not to be confused with Julia and Julia, a 1987 Italian film; or Julia (1977 film). Julie & Julia is a 2009 American comedy-drama film written and directed by Nora Ephron starring Meryl Streep, Amy Adams, Stanley Tucci, and Chris Messina. The film contrasts the life of chef Julia Child in the early years of her culinary career with the life of young New Yorker Julie Powell, who aspires to cook all 524 recipes in Child's cookbook in 365 days, a challenge she described on her popular blog that made her a published author. Ephron's screenplay is adapted from two books: My Life in France, Child's autobiography written with Alex Prud'homme, and a memoir by Powell, Julie & Julia: 365 Days, 524 Recipes, 1 Tiny Apartment Kitchen (later retitled Julie & Julia: My Year of Cooking Dangerously). Both of these books were written and published in the same time frame (2004–06). Powell's book was based on her blog The Julie/Julia Project, where she had started documenting online her daily experiences cooking each of the 524 recipes in Child's Mastering the Art of French Cooking. The film is the first major motion picture based on a blog. In March 2008, Ephron began filming with Streep as Child and Adams as Powell. On July 30, 2009, the film officially premiered at the Ziegfeld Theatre in New York; and, on August 7, 2009, it opened throughout North America. It received positive reviews from critics, who praised Streep's performance. Streep and Adams previously starred together in Doubt (2008). Streep and Tucci previously starred together in The Devil Wears Prada (2006). 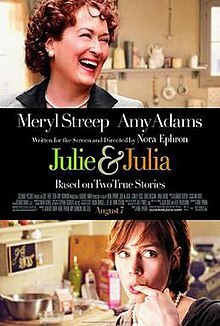 Julie & Julia was Ephron's last film before her death in 2012. The film is presented in a series of flashbacks between present day and past, jumping between various moments in both Julie and Julia's lives. The following plot summary separates the plot based on character. In 2002, Julie Powell (Adams) is a young writer with an unpleasant job at the Lower Manhattan Development Corporation's call center, where she answers telephone calls from victims of the September 11 attacks and members of the general public complaining about the LMDC's controversial plans for rebuilding the World Trade Center. She is discontented with this, and is disheartened at watching her acquaintances succeed in their own professions. She is happily married to Eric Powell (Messina), a writer for a magazine. To do something she enjoys, she decides to cook every recipe in Mastering the Art of French Cooking (1961) by Julia Child (Streep) in one year; Powell decides to write a blog to motivate herself and document her progress. She is initially met with criticism from her mother, who finds that the task is pointless, but she begins to gain a following. Eric supports her in this. She is asked to host Judith Jones (Dilly), who was Child's editor. Julie attempts to make beef bourguignon for the occasion, but falls asleep while waiting for it to cook, and it burns. She reattempts it, this time it is successful. Jones cancels last minute due to the weather, leaving Julie disheartened as she had hoped that her meeting with Jones would lead to a book contract. Eric remains optimistic, frustrating Julie. He is hurt over Julie's prioritization of her blog and readers over their marriage and he leaves after an argument. She takes a short break from cooking, but after her mother demonstrates support for her cooking, she decides to return to it. Eric returns, after he reads her blog post in which she demonstrates remorse for her actions. Julie is visited by The New York Times who feature her blog in a story, after which her project begins to receive the attention of journalists, and literary agents, publishers. Julie is hurt when Child gives a dismissive comment on Julie's blog. In the 1950s, Julia Child, an enthusiastic and unabashed woman, moves to Paris with her diplomat husband, Paul Child (Tucci). She attends Le Cordon Bleu to learn French cooking, and is initially met with skepticism as she is the only woman in the class. Madame Elizabeth Brassart (Buck), the proprietress of the school and Child clash. She is undaunted however, and begins collaborating on a book about French cooking for American housewives with Simone Beck (Edmond) and Louisette Bertholle (Carey). Paul warns Julia that he may be assigned elsewhere, as his four-year assignment in Paris will be ending soon. She remains optimistic that they will not move Paul, and if they do, they'll remain in Europe. Child's book is offered publication soon before Paul is reassigned to Marseilles. She and Simone plan to tell Louisette that she will be receiving a smaller share of the royalties they receive from the book due to Louisette's lesser contribution to the project. After learning Louisette is getting a divorce, they waive their claims. Although Child's book is rejected by Houghton Mifflin, it is accepted and published by Alfred A. Knopf. The last scene shows Powell and her husband visiting Child's kitchen at the Smithsonian Institution and Child in the same kitchen receiving a first print of her cookbook and celebrating the event with her husband. Mary Lynn Rajskub as Sarah, Julie's friend. The film received positive reviews from critics, and Streep's performance was highly acclaimed by critics. Rotten Tomatoes gave the film a score of 75% based on 212 reviews, with an average score of 6.7/10 with a "Certified Fresh" rating, and the site's critical consensus states: "Boosted by Meryl Streep's charismatic performance as Julia Child, Julie & Julia is a light, but fairly entertaining culinary comedy." Metacritic, which assigns a rating out of 100 top reviews from mainstream critics, gave it an average score of 66% based on 34 reviews. Los Angeles Times critic Kenneth Turan commented, "[Julie & Julia] does it right. A consummate entertainment that echoes the rhythms and attitudes of classic Hollywood, it's a satisfying throwback to those old-fashioned movie fantasies where impossible dreams do come true. And, in this case, it really happened. Twice." The A.V. Club gave the film a C, explaining, "Julie & Julia is two movies in one. That's one more movie than it needs to be." Entertainment Weekly gave it a B+. The review by Slate was also positive. Streep has been widely praised for her performance as Child. Movie critic A. O. Scott of The New York Times affirmed that "By now [Streep] has exhausted every superlative that exists and to suggest that she has outdone herself is only to say that she's done it again. Her performance goes beyond physical imitation, though she has the rounded shoulders and the fluting voice down perfectly." Reviewer Peter Travers wrote in Rolling Stone that "Streep—at her brilliant, beguiling best—is the spice that does the trick for the yummy Julie & Julia." Similarly, Stephanie Zacharek of Salon concluded that "Streep isn't playing Julia Child here, but something both more elusive and more truthful—she's playing our idea of Julia Child." On its opening weekend, the film opened #2 behind G.I. Joe: The Rise of Cobra with $20.1 million. ^ "Tweetin' Streep". Zagat.com. July 30, 2009. ^ "Chris Messina Joins Julie & Julia". 2007-12-13. Retrieved 2008-06-18. ^ Bryon Perry (2008-03-05). "Jane Lynch". Variety. Retrieved 2008-06-18. ^ "24's Rajskub Cooks Up Role in Julie and Julia". Archived from the original on 2008-07-05. Retrieved 2008-06-19. ^ a b "Julie & Julia (2009)". Metacritic. Retrieved 2009-08-09. ^ "Julie & Julia". Rotten Tomatoes. Flixster. Retrieved November 10, 2010. ^ A.O. Scott, The New York Times: Two for the Stove, movie review of Julie & Julia. Aug 7, 2009. ^ Peter Travers, Rolling Stone: Movie Review of Julie & Julia. Aug 6, 2009. ^ Gans, Andrew (2010-02-02). "Academy Award Nominations Announced Feb. 2; "Nine" Receives Four Noms". Playbill.com. Archived from the original on 2010-02-05. Retrieved 2010-02-21. ^ Karger, Dave (2010-01-21). "'Avatar,' 'An Education,' 'Hurt Locker' dominate BAFTA nominations". Entertainment Weekly. Archived from the original on 2012-03-26. Retrieved 2010-01-21. ^ Verniere, James (2009-12-14). "Meryl Streep, Mo'nique pick up Boston Film Critics' nods". Boston Herald. Retrieved 2010-01-03. ^ "THE 15th CRITICS' CHOICE AWARDS NOMINEES". BFCA. Archived from the original on 2010-10-17. Retrieved 2010-01-03. ^ ""The Hurt Locker" Takes Top Honours". Chicago Film Critics Association. 2009-12-21. Retrieved 2010-01-03. ^ Tabouring, Frank (2009-12-18). "Detroit Film Critics Society Awards 2009". IMDb. Retrieved 2010-01-03. ^ "T2009 EDA Awards Nominees". [Alliance of Women Film Journalists]. Retrieved 2010-01-05. ^ "Nominations & Winners". HFPA. Archived from the original on 2010-01-08. Retrieved 2010-01-03. ^ "Kansas City Film Critics Circle Homepage". Kansas City Film Critics Circle. Retrieved 2010-01-05. ^ "Film". LFCC. Retrieved 2010-01-12. ^ "Best Actress Awards". New York Film Critics. Archived from the original on 2010-03-26. Retrieved 2010-01-03. ^ "NEW YORK FILM CRITICS ONLINE AWARDS FOR 2009". Arizona Reporter. Archived from the original on 2012-06-02. Retrieved 2010-01-05. ^ "North Texas Film Critics Association announces results of member voting for best of 2009". Pegasus News. Archived from the original on 2010-04-09. Retrieved 2010-01-12. ^ "Oklahoma Film Critics Circle Names "The Hurt Locker" Best Movie of 2009". OFCC. Archived from the original on 2010-01-01. Retrieved 2010-01-03. ^ "DLocal Film Society Announces Awards". KPHO Entertainment News. 2009-12-22. Archived from the original on 2011-06-14. Retrieved 2010-01-03. ^ "2009 SAN FRANCISCO FILM CRITICS CIRCLE AWARDS". SFFCC. 2009-12-14. Archived from the original on 2011-03-06. Retrieved 2010-01-03. ^ "2009 14th Annual SATELLITE AWARDS". International Press Academy. 2009. Archived from the original on 2011-10-08. Retrieved 2010-01-03. ^ "Awards". SFFCC. 2009. Archived from the original on 2010-12-17. Retrieved 2010-01-03. ^ "Toronto Film Critics Association Awards 2009". Archived from the original on 2010-03-23. Retrieved 2010-01-05. ^ "Our Awards: 2009". WAFCA. 2009-12-07. Retrieved 2010-01-03. ^ "2010 Writers Guild Awards Screen Nominees Announced". 2010. Archived from the original on 2016-03-11. Retrieved 2016-04-25.